It wasn’t even a religious comment. It was, instead, a name. Traugott, in German. A name given to a child born 187 years ago tomorrow, on the fifth of February 1830. Probably bestowed at his baptism in the Lutheran Church. Friedrich Traugott Geissler.1 The Legal Genealogist‘s second great-granduncle. Friedrich after his father, Friedrich Geissler, so perhaps he was called Freddy, perhaps some other diminutive. Maybe something chosen by his mother, Maria Rosina Schumann. But the middle or baptismal name: Traugott. Trust in God, his parents selected. Trusting that he would learn to crawl, then to walk, then to run. 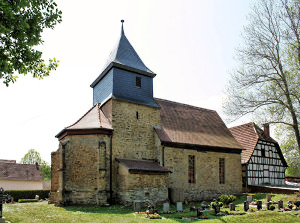 Trusting that he would learn what he needed to learn there in Ossig, the small village in Sachsen-Anhalt, just north of the border with the modern German state of Thuringen,3 where the family lived. Trusting that he would grow to manhood. Trusting that he would marry. Trusting that he would father children, and carry the family name forward into the next generation. There are no other records of this boy’s existence. No photos. No mementos. No letters. No diaries. Nothing to record his life. Nothing to record his family’s hopes and dreams. But for a church record or two, he might not be known at all. So we pause today to honor this kinsman, lost too soon. To reflect on the trust of his parents in choosing his name. Trust in God, they chose. Trusting, in the end, for his soul. Very nice tribute Judy. I wonder if he was actually called by the middle name per Germanic custom of the first name being the name of a saint and the second name being the common name. I find this the case in a number of Germans I have researched. As with anything, there were no doubt exceptions to this practice. I have that as well in some of my lines, Jim, but it seems to be a bit less so in this particular family. Very touching post. I think that all the time doing research that for some people the only way to know they were on this earth was a couple lines in a church book. Wikipedia may not have an English page for Ossig, but the German disambiguation page for Ossig leads to Gutenborn in Sachsen-Anhalt [https://de.wikipedia.org/wiki/Gutenborn]. I often use the foreign language versions of Wikipedia to get information on small places or local/obscure historical events, then GoogleTranslate for the details. I did find that, and it appears that what was once the village of Ossig may now be part of the municipality of Gutenborn, but the website doesn’t say that, so I’m not going to use it as a citation.